Find out how easy it could be for you to become a non-smoker in one single session. 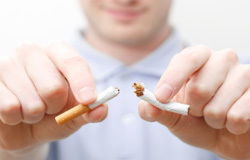 A smoking cessation session using suggestion hypnotherapy takes less than 1 hour. In the first part of the session I will discuss with you the reasons you smoke, your current smoking habits and then we will examine your reasons why you now want to quit. My aim is to re-educate the unconscious part of the mind about smoking also, to promote calmness and a feeling of well-being and to ward off feelings of stress and irritability often associated with quitting smoking. Each session is tailor-made for the individual and care is taken to help with symptom substitution such as overeating. You must decide to stop smoking for your own good reasons. Start to think now about your 3 main reasons why you want to quit and make them as personal to you as possible. E.g... to get rid of that awful cough in the morning! Smoking a pack of cigarettes a day increases risk for all cancers by 200 percent, lung cancer by 1000 percent and heart disease 300-400 percent. Smoking two or more packs a day increases lung cancer risk by a factor of 15-25 (i.e., by 1500 percent to 2500 percent). Surveys have consistently shown that at least 70% of adult smokers would like to stop smoking and of those who express a desire to quit, more than a third are ery keen to stop. Almost nine out of ten (88%) of smokers state that they want to quit because of a health concern. After health reasons, the next most common reason given for wanting to give up is a financial one.